With no barrier between you and the crawlspace, musty odors (and worse) get drawn into your living area due to natural convection, also known as the stack effect. Regardless of whether the floor above your crawlspace is insulated and the condition of your insulation, there is air movement between your crawlspace and home. It is driven by the “stack effect” or convection. 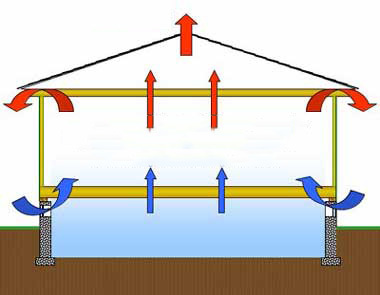 Warm air in the upper level or attic of your home rises and is expelled through windows, vents, cracks, and gaps. As it rises, air from lower levels of your home rush in to fill the vacuum. Those lower levels include the crawlspace. How Does this effect the Crawl Space? Air from your crawlspace enters your home along with everything in it. Odors, and mold spores and dust mite feces enter your living area. This can cause a variety of respiratory problems, including allergies and asthma. Air, often filled with more moisture, gets sucked into the crawlspace from the outdoors. In this sense, a poorly designed crawlspace acts like a bad air machine!